Sydney's sparkling harbour is the jewel in the city's crown. It's flanked by golden beaches and bushland. Islands sprinkle its waters, and it is crisscrossed by all manner of craft, from water taxis and yachts to tour boats and ferries. This magnificent identity is also bisected by one of the worlds most famous bridges. 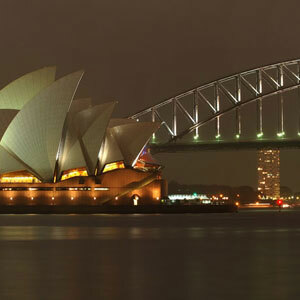 The dramatic water vista of the Sydney Harbour Bridge together with the nearby Sydney Opera House is an internationally recognized icon of both Sydney and Australia. 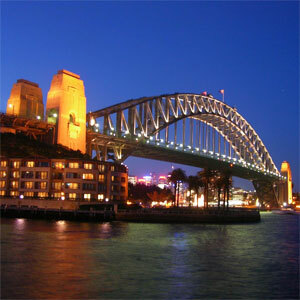 The Sydney Harbour Bridge is one of Australia's most internationally recogised icons. 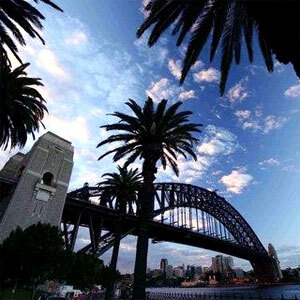 Stretching over the magnificent Sydney Harbour, the two ends connect Dawes Point (in Sydney's Rocks area) and Milsons Point (in Sydney's lower North Shore area). The bridge carries six lanes of road traffic on its main roadway, two lanes of road traffic (formerly two tram tracks) and a footpath on its eastern side, and two railway tracks and a bicycle path along its western side. The road across the bridge is known as the Bradfield Highway and is about 2.4 km (1.5 miles) long, making it one of the shortest highways in Australia. At 48.8 m (151.3 feet) wide, it is the widest long-span bridge in the world (Guinness World Records, 2004). The bridge deck portion of the highway is 1.15 km (0.71 miles) long. It is concrete and lies on trimmers (beams that run along the length of the bridge). The trimmers themselves rest on steel beams that run along the width of the bridge. The trimmers and beams are visible to boats that pass underneath the bridge. The arch is composed of two 28-panel arch trusses. Their heights vary from 18 m (55.8 feet) at the center of the arch to 57 m (176.7 feet) (beside the pylons). The arch span is 503 m (1,559 feet) and the weight of the steel arch is 39,000 tons. The arch's summit is 134 m (415.4 feet) above mean sea level, though it can increase by as much as 180 mm (7 in) on hot days as the result of steel expanding in heat. Two large metal hinges at the base of the bridge accommodate these expansions and contractions and thereby prevent the arch from being damaged. The steel used for the bridge was largely imported. About 79% came from Middlesbrough in the North East of England, the rest was Australian-made. The granite used was quarried in Moruya, New South Wales, and the concrete used was also Australian made. The total weight of the bridge is 52,800 tonnes, and six million hand-driven rivets hold the bridge together. The rivets were made at the Park Bridge Ironworks in Lancashire England. The two pairs of pylons at each end are about 89 m (276 feet) high and are made of concrete and granite. Abutments, which support the ends of the bridge, are contained at the base of the pylons. They prevent the bridge from stretching or compressing due to temperature variations. Otherwise, the pylons serve no structural purpose and are primarily to visually balance the bridge itself. They were originally not part of the design but were added later to allay concerns about structural integrity — ironically, as the pylons do not actually touch the bridge (except at road level). Although inserted into the designs for their aesthetic value, all four pylons have now been put to use: a museum and tourist centre with a lookout of the harbour is contained in the southeastern pylon. The southwestern pylon is used by the New South Wales Roads and Traffic Authority (RTA) as a base for their CCTV cameras overlooking the bridge and the roads around that area. The two pylons on the north shore are now venting chimneys for fumes from the Sydney Harbour Tunnel. Visitors can now climb the Harbour Bridge for a view of Sydney and the Harbour that is rivalled only by Centrepoint Tower. These tours have strict safety requirements, and are operated by Bridge Climb. These operate at various times during the day, and are subject to weather conditions and maintenance requirements.